Welcome to the Barber Region of the 2016 HornRank Marching Brackets! You can read about how we seeded shows or vote in the Copland Region, the Shostakovich Region, and the Reich Region. The first round closes on Wednesday, March 23, 2016, at 11:59 P.M.
Avon having two number 1 seeds in our bracket is a testament to the group's astounding impact on the marching world in the past ten years. Avon’s completion of the Grand Nationals Championship three-peat came in 2010 with “Iconoclash”, another show that is regarded as a gold standard for marching band excellence. Blue Springs made their first ever Grand National finals appearance in 2015, and the show was one to remember. “Subliminal” was an expertly designed show with a fascinating theme, deafening brass sound, and a pair of drum majors forced to their knees by the power of hidden messages. This show got Blue Springs over the hump and into finals, putting their program in a position for even more success in the future. 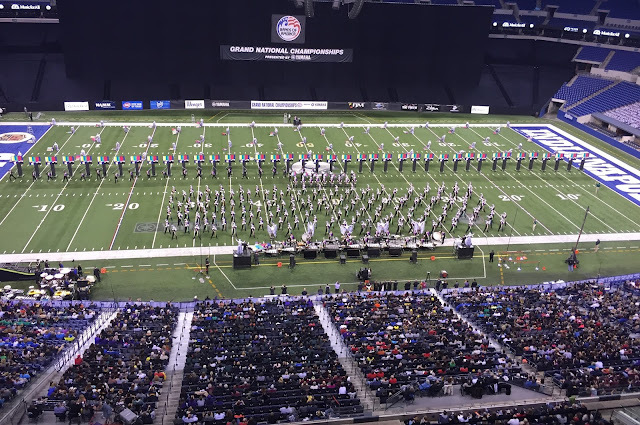 Broken Arrow’s “FaceME” show in 2014 finished second at Grand Nationals behind champion Tarpon Springs by a mere 0.15 points. This was a classic Broken Arrow show that had bright colors, daring color guard performance, and a hornline sound that is tough to match. LD Bell continued their string of excellence in 2011 with “Circle’s Edge”, a show etched into the record books as a San Antonio Champion. Broken Arrow’s 2012 performance of “Surrender to Hope” is one of the most beloved shows in BOA history to date. Also featuring music from Samuel Barber like Avon 2010, the show is often remembered for the hornline’s opening hit. While Broken Arrow did not repeat and win a second straight eagle at Grand Nationals, this show’s impact was felt beyond their placement. Claudia Taylor Johnson’s "Enigmatic" in 2013 has also gone a long way in moving forward the BOA activity. A general effect masterpiece, CTJ’s show had acrobats performing in perfect coalition with the rest of the band. It is no secret why these two shows are in HornRank’s bracket. LD Bell’s 2007 show is one of the best Grand Nationals performances to date. The Pan’s Labyrinth-esque show won the hearts of fans and judges, placing first at Grand Nationals and remembered for the haunting color guard escorting the young girl around the field. Ronald Reagan asserted their reappearance near the top of the best programs in the nation with Every(One), taking second at San Antonio in 2015. Make sure to also vote in the first round of the Copland Region, the Shostakovich Region, and the Reich Region.